The trio of moose who I showed you swimming in a pond last week has been hanging out together. They are seeking out water but sometimes the sources are not as big as a pond. 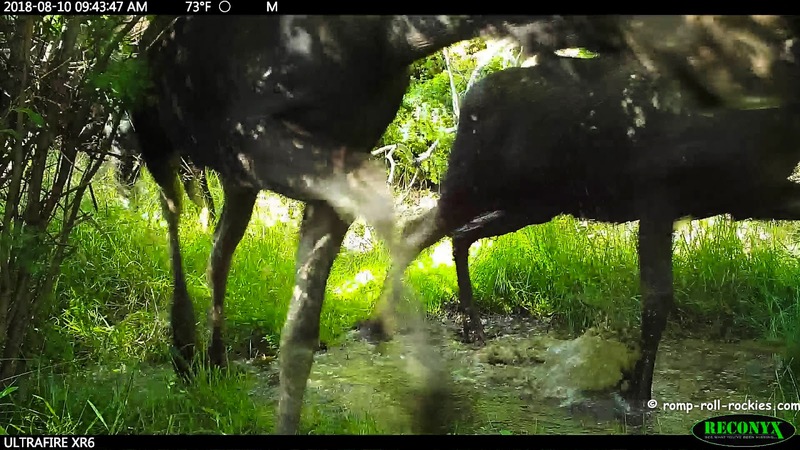 Recently, they visited a water hole together, and it appeared that they had a squabble over water rights (just like the people in the west!). When they first arrived at the water hole, the female went in the water and drank. 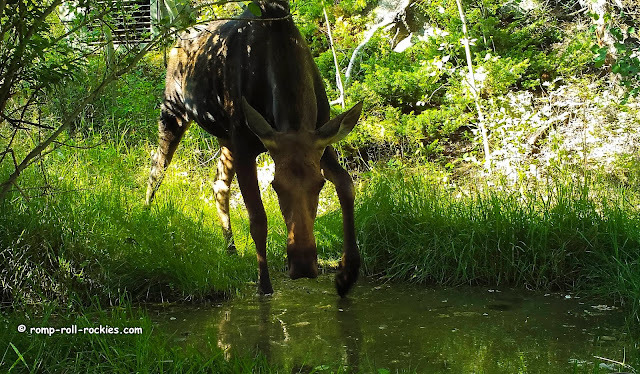 Then a bull arrived and cow moose amicably shared the water hole with him. He arrived like a mack truck, barreling into the pair of moose and making them move out of the water. The male in the pair who was just bullied out of the water looked hard at the moose who had thrown him out but no fight broke out. The moose who had successfully claimed the water was definitely the biggest of the three. Then, the biggest moose monopolized the water for the rest of their time at the water hole. He lay down in the water and did not budge even when the others paced past him. Finally, when he saw the other two leaving, he abandoned the water to follow them. I hope that they forgave him. Due to technical difficulties, you have to click the link to see the video! Thanks! Oh those water wars can be something! Oh, goodness! I could watch them forever! 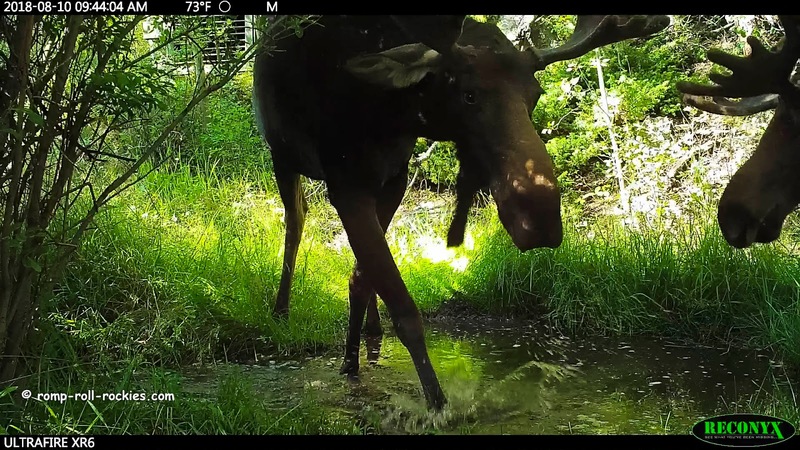 That one moose got so close to the trail cam!!! I think that the original post showed an old video. I'm so sorry! If you follow the new link, it will work right! This reminds me of the hummingbirds at my feeder. Plenty of feeding stations but will they SHARE? Love the bellow that the moose makes! They are such fun to watch! Your videos and your commentary are always so interesting to us. Love watching the moose be so graceful in getting down on his knees despite his enormous size. I love that you have moose where you live. They would come into our yard in the Stockholm suburbs back in the day. Pretty sure that doesn't happen any more. It's great to see them here, they are so magnificent, I think. Bullying goes on in every species I guess! We could watch the moose all day long! Clearly being the big guy on the block has its advantages.